A lot of permaculture books and videos promote the idea of “chop and drop” for weeds. If you pull up weeds, you disturb the soil and give new weed seeds an opportunity to germinate and take hold. By chopping, you kill the weed without disturbing the soil. And by dropping you mulch the soil, suppressing further weeds, helping to retain moisture, and returning nutrients to the soil. 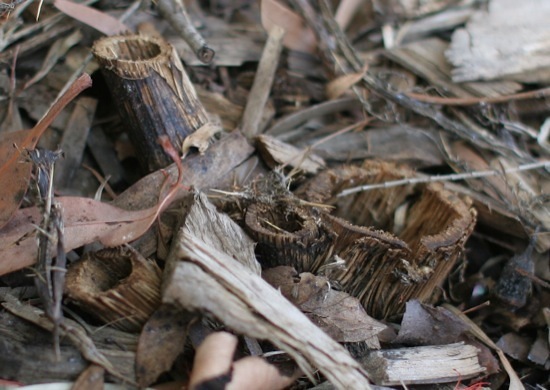 It’s often the case that a plant has as much biomass below ground as above. 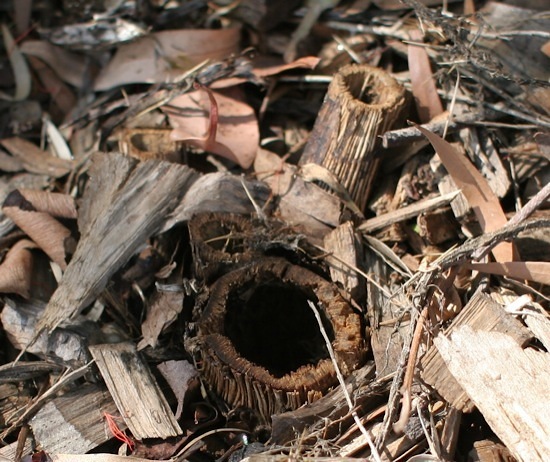 When you kill it without removing the roots, that underground biomass will die and rot in-place, opening up little channels through the soil for air and water to penetrate and promoting microscopic soil organisms. These photos are of a thistle I cut down (yes, it got a bit big before I got around to it!). You can see that as the remaining stem died and started to break down, it left a hollow tube of organic matter going down into the soil. Not all plants will die off when cut. In theory, if you keep cutting them back as soon as shoots return, you’ll eventually exhaust the stored energy in the root and the plant will die. In practice, though, it takes a lot of persistence to beat weeds this way. If you find some weeds keep re-shooting, pull them up and deal with the soil disturbance by mulching heavily with other chopped weeds. Make sure to chop your weeds before they flower and set seed, otherwise you’ll have even more growing back. Any old saying says, “One year’s seeds, seven years’ weeds”. It’s also good to use this technique on spent vegetables. Plants like broccoli, corn, beans, peas, etc can be cut off at ground level after the harvest, and the following crops can be planted around the stumps. It’s a great way to keep the soil open and aerated, while introducing organic matter under the surface with zero effort. Thanks for the tip about leaving old veggie plants in the ground. I practice it for broad beans, but now I will try it with other varieties as well. @Gav: Peas and beans are the best for chopping and dropping, since they usually have nitrogen nodules attached to their roots which gives the soil fertility a real boost. Other types of vegies are not quite as beneficial, but as they decompose they still put organic matter into the soil and open it up for air and water to penetrate. What a great idea! I’m going to give this a try.